There is one thing I know about Spamalot, apart from how fantastic it is, and that is as an adaptation of Monty Python and the Holy Grail not everyone will enjoy it. I know, some people actively dislike Monty Python. I prefer not to socialise with these people. There were a couple of people that came to mind however. People that I knew would love Monty Python comedy. A couple of Top Ender's favourite teachers. It pained one of them to turn down my offer of the tickets, but the other? The one I really liked because he banned the swear words "Justin Bieber" and "One Direction" from his classroom? Well, he was really up for attending the theatre in my place... and I don't think the offer of a glass of wine had anything to do with it! So, he went to the Theatre to watch the show and the next day let me know what he thought of it, his review follows and I have tried really hard not to be jealous. Described as '(lovingly) ripped off from the classic Monty Python and the Holy Grail', this musical had a lot to live up to for me, a massive fan of the original film. Thankfully, it ticks all the boxes. 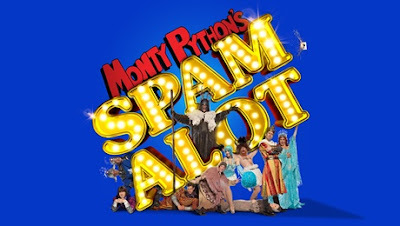 Spamalot is terrifically funny, wonderfully camp and has just the right amount of utterly ridiculous. 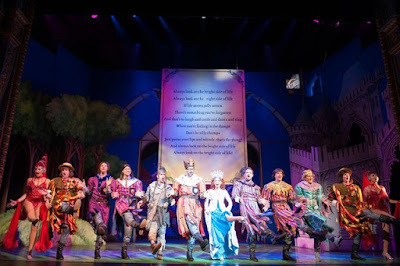 A thoroughly entertaining marriage of nostalgia-laden Python sketches, tongue-in-cheek songs and hilarious dance routines had the audience smiling the whole way through the two hour performance. 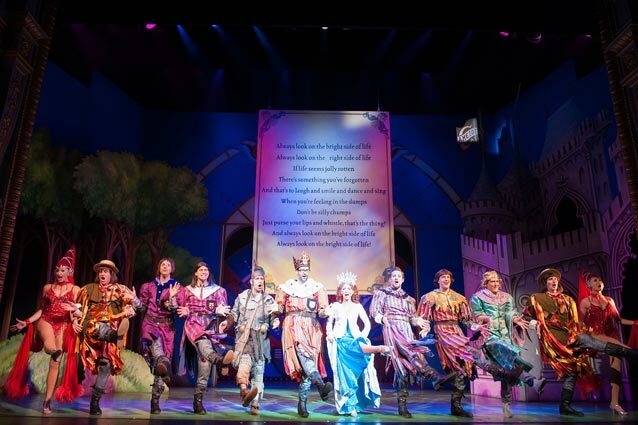 The multi-talented cast switched seamlessly between characters and costumes, impressing with both their singing voices and hammed-up dance moves. The performers, especially Earnshaw as the Lady of the Lake - whose pitch and range was flabbergasting - ended up making Pasquale (King Arthur)'s singing voice sound decidedly average. However, Pasquale made up for this with a wonderfully silly performance and impeccable comedic timing, especially in partnership with Tracani as his faithful manservant Patsy. I didn't realise it at the time of viewing, but Tracani is actually Pasquale's son, which may explain the fantastic chemistry that the pair shared on stage. In fact, for me, Tracani stole the show and was by far my favourite character. His timing and facial expressions were utterly hilarious. Patsy could easily - were it physically possible - be the illegitimate love-child of Baldrick - from Blackadder - and Lee Evans. Pasquale also had the audience and fellow cast members in stitches with his hilarious and bemusing ad-libbed rant about Mel B, a beaver and a caramel egg. Only for his fellow cast members to have their revenge later on in a scene involving the Knights who formerly said 'Ni', who now recite lines from '2 become 1' by the Spice Girls. All your favourite scenes from 'Holy Grail' were there, including the Knights who say 'Ni', the killer rabbit, the Black Knight, the Frenchmen who 'fart in your general direction' and of course the eternal debate of whether a swallow (European or African) could indeed carry a coconut from its native tropical climbs to the temperate forests of Arthur's Britain. All of this was held together by a technically brilliant performance by the ensemble, the unsung heroes of the production. I couldn't quite believe that all the music for the show was created by that small group of very talented individuals. We were given two tickets and as I didn't want to cancel at the last minute I gave them to a friend and he didn't throw the ball at Top Ender, he just saw it happen and hopefully fell about laughing like I did when she told me about the incident!